The 'Messel rail' Messelornis cristata - a specimen with preserved plumage. Photo from here. Despite its presentation in years of fieldguides and other popular books, the bird order 'Gruiformes' has in recent times been scattered to the four winds, with analyses both morphological and molecular proclaiming its polyphyly. Nevertheless, molecular analyses such as Hackett et al. (2008) continue to support a clade roughly corresponding to the suborder Grues as recognised by Cracraft (1973)* containing the cranes and the rails. The morphological analysis of Livezey & Zusi (2007) on the other hand, does not support this clade, but it does support monophyly for each of the two primary divisions within Grues, the ralloid and gruoid lineages. *Just to confuse matters, the name "Grues" has been used by different authors for clades of differing inclusivity. Mayr (2009), for instance, uses "Grues" for the Aramus + Gruidae clade, and refers to the larger clade as "core Gruiformes". The ralloid line contains the living families Rallidae*, the rails, and Heliornithidae, the finfoots (or should that be finfeet?) Cracraft (1973) regarded the Cretaceous Laornis edvardsianus as a stem ralloid, but no-one else seems to have taken him up on this suggestion. More reliably on the ralloid stem are the Palaeocene to Oligocene Messelornithidae (Mayr, 2009). Messelornithids were medium-sized birds (about the size of a small chicken) best known from Messelornis cristata for which over 500 specimens are available, some even with preserved feathering. Messelornis was highly terrestrialised with limited flight capabilities and almost ludicrously long legs (loss or reduction of flight has been a common occurrence among the Grues). Its beak was relatively short and the overall appearance of Messelornis would probably have not been dissimilar to the modern cariamas. *Hackett et al. (2008) resolved the Rallidae as paraphyletic to Heliornithidae, with Sarothrura (the flufftails) closer to Heliornis than to the other two included rails Himantornis and Rallus. A few places, at least online, have suggested recognising Sarothrura as a separate family from the Rallidae as a result, but I'd recommend waiting for a more detailed analysis with greater coverage of the Rallidae. Increased taxonomic coverage may return the flufftails to the other Rallidae, or it may make it more appropriate to treat the finfoots as derived rallids. The sungrebe Heliornis fulica of tropical South America (I tried to find a picture of one carrying chicks, but no luck). Photo by Jerry Oldenettel. The finfoots of the Heliornithidae are three species (one in Asia, one in Africa, one in South America) of tropical grebe-like birds, renowned for their reclusiveness. The South American sungrebe Heliornis fulica is the most distinctive in appearance of the three species (though mitochondrial analysis indicates that it and the Asian Heliopais personata form a clade to the exclusion of the African Podica senegalensis - Fain et al., 2007) and is also very distinct in its nesting behaviour. Heliopais and Podica, like most aquatic birds, have chicks that hatch out reasonably well-developed and immediately able to swim after their parents. Heliornis, in contrast, has altricial chicks that hatch out after only ten to eleven days of incubation. The really amazing bit, though, is what happens after the chicks hatch. The male sungrebe has a shallow pouch under each wing and he is able to transport the chicks inside this pouch, even flying with them. Whether the chicks remain in the pouches permanently or whether they are only placed in them while the male is travelling remains unknown. Funnily enough, while this chick-carrying behaviour was described by Alvarez del Toro in 1971, it had originally been recorded almost 140 years earlier by Prince Maximilian of Wied. It seems that everyone else had assumed the prince was smoking something. 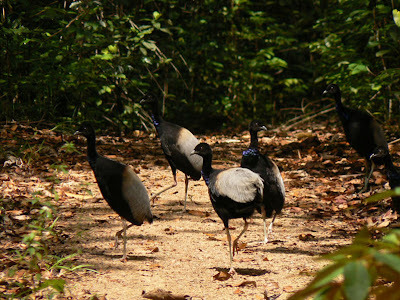 Grey-winged trumpeters, Psophia crepitans. Photo by A. Vinot. The gruoid lineage includes Psophia, the trumpeters, Aramus guarauna, the limpkin, and Gruidae, the cranes, as well as the fossil taxa Parvigrus pohli, Geranoididae and Eogruidae. Most recent authors agree that Aramus and Gruidae form a clade to the exclusion of Psophia. The chicken-sized Oligocene Parvigrus was originally described by Mayr (2005) as sister to Aramus + Gruidae, but he later (Mayr, 2009) revised its position to stem gruoid. Parvigrus lacked the long beak of limpkins and cranes, as do the Recent trumpeters, three species of similarly chicken-sized birds found in northern South America. Whether Geranoididae and Eogruidae possessed crane-like long beaks is an unknown factor as skull material for both has not been found. Cracraft (1973) placed both outside the crown gruoids, but Clarke et al. (2005) placed Eogruidae inside the gruoid crown as sister to Aramus + Gruidae. The Eocene Geranoididae have been described only from leg bones (Wetmore, 1933, assigned some wing bones to Geranoides jepseni in his original description of this species but did not describe them) so little can be said about them except that they were large and long-legged. 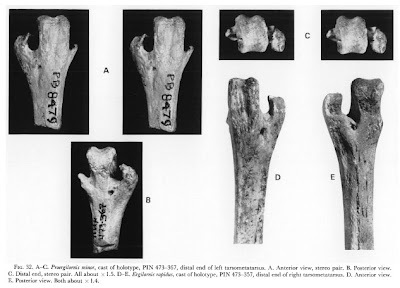 Wetmore (1933) commented on the unusually wide spacing of the trochleae (the 'knuckles') at the end of the tarsometatarsus suggesting that Geranoides had very widely splayed toes, but Cracraft (1969) later attributed to wide spacing to post-mortem distortion. Cracraft (1969, 1973) included a number of Eocene birds in the Geranoididae but admitted a lack of derived characters uniting them; Geranoididae may represent a paraphyletic assemblage of basal gruoids. Distal ends of tarsometatarsi of the eogruids Proergilornis and Ergilornis, showing reduction of the inner trochlea in Proergilornis and its loss in Ergilornis. Figure from Cracraft (1973). The Eocene to Pliocene Eogruidae were also decent-sized long-legged birds from central Asia and (in later times) Europe. Earlier authors recognised two families, Eogruidae and Ergilornithidae, but 'ergilornithids' are now recognised as derived eogruids. Eogruids were highly cursorial birds and a humerus attributed to Ergilornis suggests that it was flightless, though the earlier Eogrus aeola shows no sign of being so (Clarke et al., 2005). Originally three-toed, eogruids showed a reduction in the size of the inner toe, and Ergilornis and Amphipelargus (the latest of the eogruids) lost it entirely (it is easy to present a progression from flying and three-toed to flightless and two-toed, but be warned that three-toed species survived into the Miocene, well after the appearance of the two-toed forms). The only other birds to reduce the number of toes to two are the ostriches, and a relationship between ostriches and eogruids has been suggested in the past (generally in association with the idea that the ratites do not form a monophyletic group). However, Cracraft (1973) confirmed that eogruids were more similar in their fine morphology to gruoids than ostriches, and modern phylogenetic analyses do not support a close relationship of ostriches and gruoids. Many people carry the impression that flightlessness in birds is associated with lack of predators. However, eogruids evolved flightlessness in an environment in which predators were no rarity (amongst others, they shared their world with such horrors as hyaenodonts and entelodonts*). Similarly, while the exact circumstances in which they became flightless is unknown, modern ostriches (Africa), emus (Australia) and rheas (South America) all live alongside significant predators or at least did so until recently. Obviously, something other than lack of predators is at play here. *I always imagine Roald Dahl's hornswogglers to be something like an entelodont. Clarke, J. A., M. Norell & D. Dashzeveg. 2005. New avian remains from the Eocene of Mongolia and the phylogenetic position of the Eogruidae (Aves, Gruoidea). American Museum Novitates 3494: 1-17. Cracraft, J. 1969. Systematics and evolution of the Gruiformes (class, Aves). 1, The Eocene family Geranoididae and the early history of the Gruiformes. American Museum Novitates 2388: 1-41. Cracraft, J. 1973. Systematics and evolution of the Gruiformes (class Aves). 3, Phylogeny of the suborder Grues. Bulletin of the American Museum of Natural History 151: 1-127. Fain, M. G., C. Krajewski & P. Houde. 2007. Phylogeny of "core Gruiformes" (Aves: Grues) and resolution of the limpkin–sungrebe problem. Molecular Phylogenetics and Evolution 43: 515-529. Mayr, G. 2005. A chicken-sized crane precursor from the early Oligocene of France. Naturwissenschaften 92: 389-393. Mayr, G. 2009. 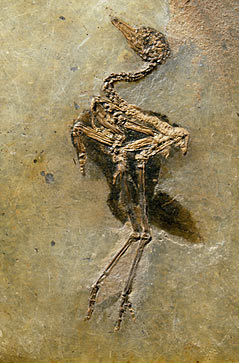 Palaeogene Fossil Birds. Springer. Wetmore, A. 1933. Fossil bird remains from the Eocene of Wyoming. Condor 35: 115-118. By the way, didn't the African Himantornis come out as basal to all other rails and possibly deserving of its own family here and there? I find your suggestion of finfoots being derived rails very interesting. If so, this could partly explain their complete lack of a fossil record: they could be fairly recently evolved rather than an old, Paleocene/Eocene lineage with an impressive ghost lineage. Himantornis has previously been regarded as the sister taxon to all other rails, and has been placed in its own subfamily. I've seen word online of an abstract presented at a recent conference of a molecular study on rails that found results consistent with the Hackett et al. tree - a basal division in rallids between Sarothrura and a few related genera on one hand, and a clade of remaining rallids (including Himantornis) on the other. However, the study described in the abstract has not been officially published yet (as far as I know), and the abstract didn't mention whether finfoots were included and where they turned up if they were. Psophia also lacks a reliable fossil record (a couple of scrappy fossils have been attributed to psophiids, but they're a bit doubtful) and would have an almost equally long ghost lineage considering the age of fossil aramids and gruids. About the evolution of flightlessness in birds and the presence of terrestrial predators... How often during their evolutionary history has it happened that birds living on continents alongside significant terrestrial predators (i.e., excluding marine birds and birds that live on oceanic islands) have become flightless? Among extant taxa, we have the already mentioned large ratites, but there are a couple of other examples too. A few species of grebe, including the Titicaca grebe Rollandia microptera, and the giant coot Fulica gigantea are reportedly flightless. These flightless grebes and coots all live in South America by high-altitude lakes, which are admittedly a very special environment; still, potentially at least these birds share (or have shared until recently) their habitat with terrestrial mammalian predators. Then there are a few terrestrial bird taxa, such as the roadrunners Geococcyx and the tinamous, which technically aren't flightless but which in practice are very nearly so. This suggests that large body size is not necessarily a prerequisite for losing flight in terrestrial birds. What about the fossil record? Apart from the eogruids, are there any other suspected cases of flightlessness in small- to medium-sized, terrestrial continental birds? In the large size range, there's also such birds as phorusrhacids and various stem anseriforms such as gastornithids and dromornithids. I can think of less examples of smaller flightless continental birds - the smaller phorusrhacids, perhaps (how much do we know about the flight capabilities of the smaller fossil Cariamae? ), and I mentioned in the post that messelornithids would have been weak fliers at best. New Zealand (which is more "continental" than "oceanic island") was home to a large number of flightless birds of all sizes despite the presence of some pretty impressive predators. But of course, the predators in question were mostly aerial (eagles, hawks, falcons, owls) which rather changes the game-plan when it comes to avoiding them. Tinamous and also galliforms are a bit different in that they're burst-launchers, so they still regularly use flight as an escape mechanism (indeed, I've heard that, in terms of energy release against time, burst-lauchers are more powerful fliers than most other birds). Tinamous are apparently notorious for their George-of-the-Jungle flight patterns. I suddenly notice that the examples you had of smaller flightless continental birds (as well as steamer ducks, which are another example that springs to mind) are water birds that would have escape into water as an alternative to escape into the air. Good call. Don't know the answer to that question though; any experts on Neotropical bird evolution reading this? To the "almost flightless" category one could perhaps also add the hoatzin Ophistocomus hoazin? Is there now anything else known about Eogrus and its allies, or do we still know only foot bones? We have at least coracoids and some wing bones for eogruids but I don't know if any skull bones are available.